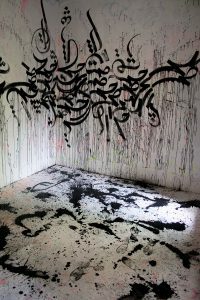 Ghalamdar (“the writer” in Farsi) is a graffiti artist (born 1994, Tehran, Iran), working since 2006. He is an active member of Calligraffiti community and called between the four most recognized Iranian street artists who are making their own mark by Art Radar Journal, and between the 12 artists crucial to the world of Iranian street art by The Huffington Post. In the beginning as a youngster he wanted to add color to his gray colored hometown by practicing variety of graffiti styles. He teamed-up with other Iranian graffiti artists such as Elf crew – between the first emerging graffiti crews in the Middle East – and painted a huge ton of big walls around Tehran. As Iranian society has never truly experienced a Hip-hop sub-culture he believes his roots lie somewhere else. Approximately parallel with the 80s graffiti and Hip-hop of America there were radical social streams using graffiti as a media for bringing the Iranian revolution of 1979 up. He thinks of his roots and the relationship between his artwork and the vandalism of the revolution – and such other Iranian social or artistic streams – and how they influence each other. For gaining his own expression, he tended to the Saqqakhaneh movement of the 1960s and 1970s, He uses calligraphy, Miniature painting (Negar-gari), folk objects, and Shi’i iconography as parts of his subject inspirations. He avoids the strict rules and preparation rituals of the craft in favor of abstraction. Saqqakhaneh artists directly inspired him to challenge the dominant pictorial material of Iranian street art aiming for developing an aesthetic with particular Iranian markers. He generally creates by reconstructing and deconstructing the Iranian folklore materials and his art is a personal investigation through the Iranian art and history.